We’ve all got that friend or family member who has a dog that no one enjoys being around. Maybe their dog is a veteran ankle-biter who also barks incessantly? Or a pushy dog that is constantly whining, pawing at, or even jumping on everyone for attention? Perhaps, their dog is still using different parts of the house as a toilet or destroying furniture and shoes for a living? Or maybe they’ve decided it’s fun to attack your feet and hands every time you walk by? Whatever the case may be, these dog parents are either blind to their dog’s faults or they’ve learned to live with their dog’s bad behavior despite the everyday stress it causes them or others. Either way, they’ve raised a dog with bad habits and poor manners, sometimes with the unfortunate consequence of friends and family members not wanting to spend much time around the dog, if at all. Early socialization is one of the most important aspects of foundational puppy training, especially if you don’t want to raise an ankle-biter that tries to “ward off intruders” every time you have guests over or a dog that is afraid or unaccepting of other dogs. For the canine species, the time period when their brain is most malleable and, therefore, will most readily process novel stimulus—meaning anything new or unknown—as normal and non-threatening is between the ages of 3 weeks to 3-4 months. This means it’s your job to introduce your puppy to as many people, places, and new environments as early as possible to help them adapt to everyday life with you. 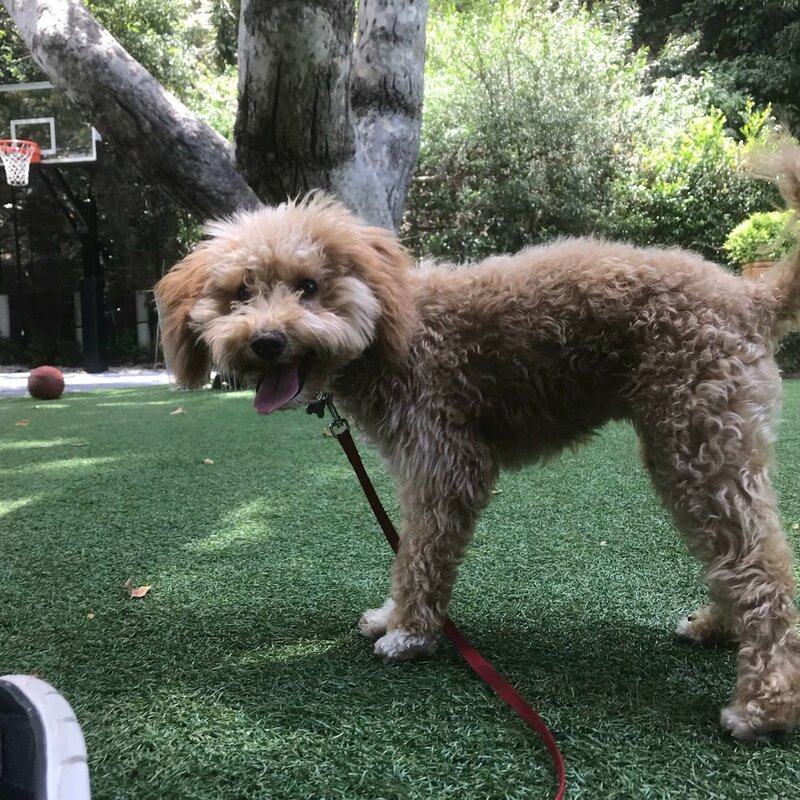 For instance, taking your puppy to a skate park where it will encounter all the sights and sounds of skateboarders will go a long way to ensure that your puppy isn't afraid of skateboarders and doesn't try to chase them when it matures. Finding ways to introduce your puppy to other puppies and grown dogs safely and making sure the experiences always remain positive is also essential if you want to ensure your puppy grows up to be dog-friendly or, at the very least, dog tolerant. If you don't know anyone with a puppy, it's a good idea to look into going to puppy classes designed to provide a safe place to socialize your puppy with other puppies that are around the same size and age. Letting a puppy roam free before it is potty-trained and knows all the house rules is like setting off a ticking time bomb in your home. Bad habits that develop early on like pottying anywhere a puppy chooses or destructive chewing can be very hard to break as a puppy grows older, so keeping a puppy in a long-term confinement area with a designated indoor legal potty area is essential to your success as a dog parent. 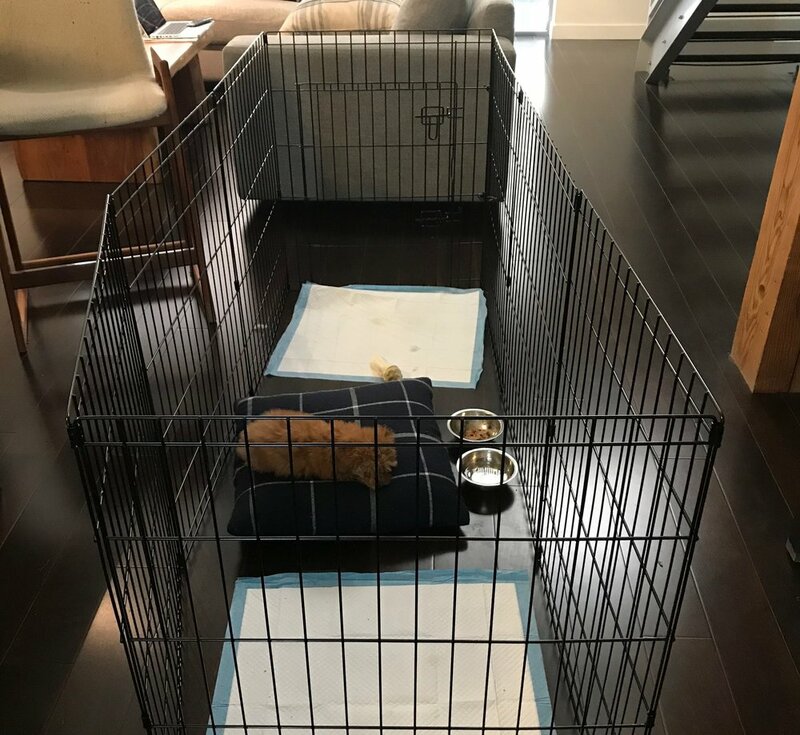 Kitchens and bathrooms can easily be turned into a long-term confinement area using pressure-mounted, walk-through gates--just provide your puppy with a bed or crate to rest in and then completely cover whatever floor space is visible with pee pads or newspaper. Exercise pens can be used to make instant playpens by attaching each end together or to the sides of a crate to create a confined space in which to keep your pup out of trouble when you cannot supervise it or when it needs to be home alone. Crate training can also accelerate the process of housebreaking a puppy because a pup is less likely to soil where it sleeps and the lack of movement prevents it from being prompted to relieve itself. The rule of thumb for how many hours you can leave a puppy crated is calculated by taking their age in months and adding one (a 3-month old puppy + 1 = 4 hours), but really, you should be paying close attention to how long your particular puppy can be comfortably left alone. How do you know how long is too long? If your puppy has soiled their crate while you were away, you left them alone for too long. 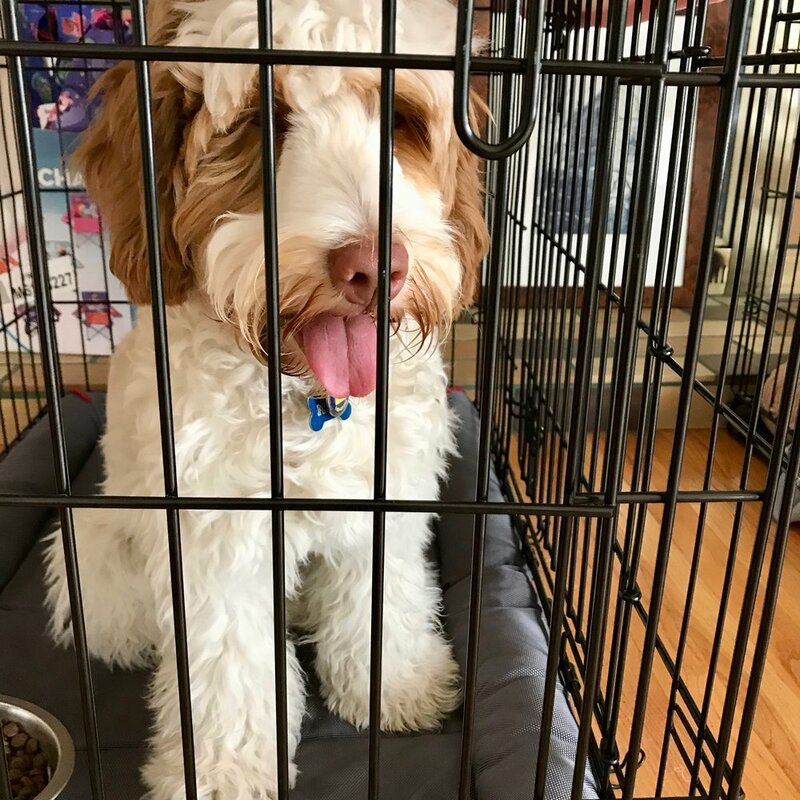 REMEMBER: A crate is NOT a puppy sitter, so be thoughtful and only leave your puppy crated for as long as you think your puppy can tolerate holding its bladder and bowels. Rough-housing with a puppy and letting it bite you may seem cute when it’s small, but remember: your puppy is going to get bigger! Soon those play-bites will become harder and more frequent unless you teach your puppy not to bite you during play. As a rule of thumb, always have a toy or chewie in your hand when playing with your puppy so you can help your puppy distinguish that biting on toys or chewies is ok, but that sinking its teeth into people is not. - If your puppy bites you, let out a loud "Ouch!" and then pull your hands away, stopping play momentarily (that's Strike One). This lets your puppy know that biting hurts and that it should be more careful! - If your puppy bites you again, let out an even louder "Ouch!" and then stand up and turn your back on your puppy (that's Strike Two), stopping play for 10-15 seconds until your puppy calms down. - If your puppy decides to bite a third time, it's time to take a break from play and let your puppy calm down by putting them back in their long-term confinement area (that's Strike Three). Sticking to a "Three Strikes, You're Out" rule helps your puppy to progressively learn that it will lose its playmate when it continues to bite down on human skin. This is not only important for your relationship with your puppy, but also for your puppy's relationship to others. A puppy that knows not to bite you is less likely to bite someone else! Dogs like to greet others by licking them on the mouth, so they will generally jump when greeting humans in an attempt to plant a canine-style kiss on their face. If you encourage this behavior, your dog will think it’s okay to jump on everyone to say hello, and you may end up with an out-of-control jumper on your hands! 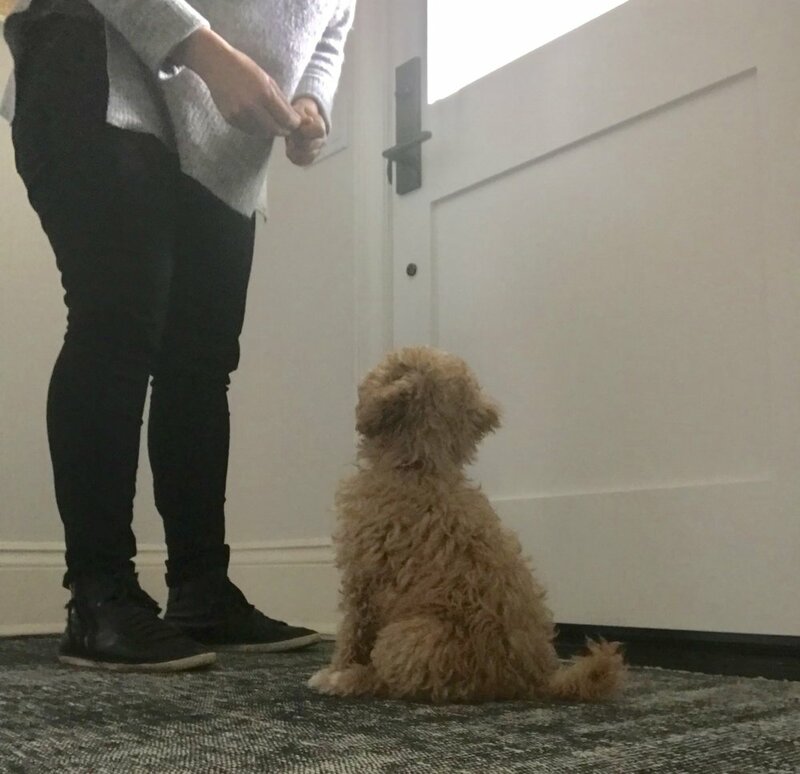 Do yourself and your puppy a favor and train it to sit to get your attention whenever your puppy wants to say hello like when you return home after an absence. Simply ignore your dog until they sit, and then say hello! When training your puppy not to jump on others, it's a good idea to keep it on a leash. That way you can step on the leash to prevent your puppy from jumping on someone, and you can reward your puppy's choice to sit as the object of their attention approaches. Simply step on the leash to prevent any jumping from occurring and reward your puppy for sitting or keeping all four paws on the ground, and ask visitors and guests to kneel down to say hello to your puppy to help it be successful at not jumping on them. Puppies learn by association and from the consequences of their actions, so be careful not to reinforce demand behaviors. If a puppy discovers they can get your attention by jumping on you, pawing at you, whining, or barking, they will continue to do so throughout their life with you. To avoid this, train your puppy that demand behaviors (also known as action-prompting behaviors) will be ignored and that calm, polite behaviors like sitting and making eye contact will win your attention. You can also make a point to reward your dog for settling down more frequently. For instance, if you have a ball crazy puppy, they may decide to drop a ball at your feet whenever they want to play fetch. However, if you pick up the ball for your puppy and throw it, you've just taught your pup that it can initiate play with you whenever it wants. On the other hand, if you pick up the ball and put away until you are ready to play fetch, your puppy learns that it must wait for you to initiate play and will most likely give up and settle down instead. Once your puppy settles down, reward it with a treat or a digestible chew to keep it busy and let it know what a great idea it was to settle down. Perhaps afterwards, at an ideal time for you, you can play a fun game of fetch with your pup. The more you reinforce calm behaviors, the more your puppy will offer them! Los Angeles dog trainer Alexandra Bassett is the owner and lead trainer at Dog Savvy Los Angeles, a dog training company that specializes in positive dog training and solving problem dog behavior like dog separation anxiety, leash reactivity, and dog aggression. She is certified as Knowledge Assessed by the Council of Professional Dog Trainers (CPDT-KA) and is available for online dog training sessions via Skype.